The all-new Cabriolet rejoins the recently launched Coupé and five-door Sportback models to complete the new Audi A5 range. 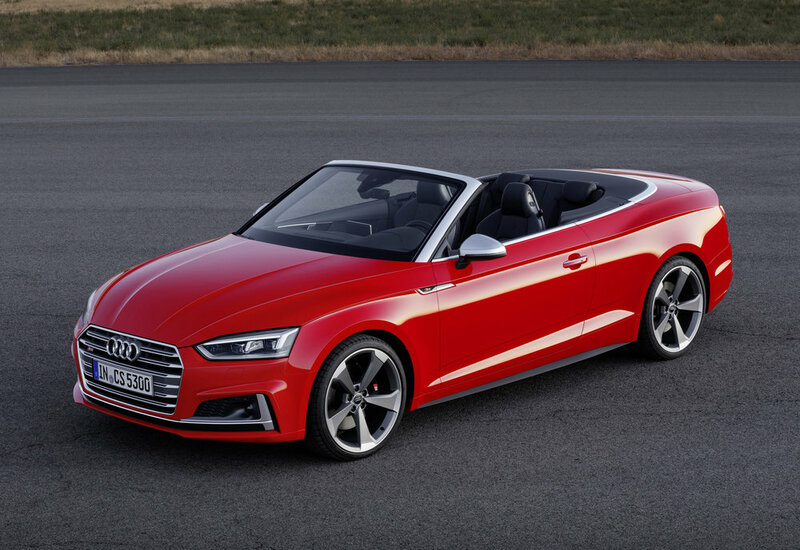 The S5 Cabriolet, powered by the same 354PS, 3.0-litre TFSI engine seen first in the latest S5 Coupé and S5 Sportback, is also making its debut at the same time – adding quattro four-wheel drive capability. 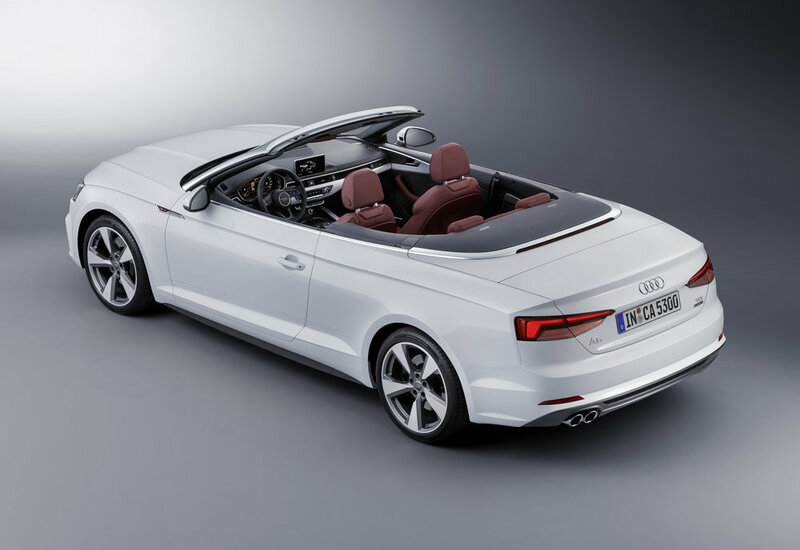 The designers very much followed the lines of the Coupé for the styling of the new A5 Cabriolet. The rear window is now flatter and there are short overhangs and a long wraparound bonnet with a power dome. At 4,673 millimetres, the new A5 Cabriolet is 47 millimetres longer than its predecessor. The soft top delivers ‘outstanding aeroacoustics’, says Audi, and a new one-touch opening function makes operating the standard acoustic hood much easier: a flick of a switch opens it fully in 15 seconds or closes it in 18-, at speeds of up to 31mph. Audi says the body of the new A5 Cabriolet is the stiffest in its class yet among the lightest. Torsional rigidity has been reduced by 40 percent compared with the previous car and total weight by up to 40 kilograms. There is initially a choice of three engines on offer – a 2.0 TFSI with 252PS, a 2.0 TDI with 190PS and a 3.0 TDI with 218PS. A 2.0 TFSI with 190PS and a 3.0 TDI with 286PS will join the line-up soon afterwards. Compared with the previous model, Audi says they deliver up to 17 percent more power while consuming as much as 22 percent less fuel and all engines will be available with a choice of six-speed manual, seven-speed S tronic dual-clutch or eight-speed tiptronic transmissions. The Audi S5 Cabriolet model accelerates from 0 to 62mph in 5.1 seconds, and on up to an electronically governed top speed of 155mph. It features quattro permanent all-wheel drive and the eight-speed tiptronic transmission as standard. With the hood closed the luggage compartment has a capacity of 380 litres. The soft top compartment in the boot automatically moves down when opening the roof and up again when it’s closed, to provide the largest possible luggage space at all times. The rear seat has a 50:50 split and can be folded forward using levers in the luggage compartment. The boot now opens automatically as standard – using the remote control key or the button in the driver’s door. Gesture control is also available with a proximity sensor in the bumper responding to a kicking movement with the foot, once it detects the optional convenience key. The all-new operating and display concept includes natural language voice control and free-text search so the driver can control all functions effortlessly and intuitively, says Audi. Standard seat belt microphones for driver and front passenger improve voice quality even with the hood open, while Audi’s virtual cockpit and head-up display are available as alternatives to the analogue instrument dials. With up to 30 driver assistance systems, the new A5 Cabriolet offers a broad range of support, while Audi is also taking the next step toward piloted driving. The adaptive cruise control (ACC) Stop&Go system including traffic jam assist relieves drivers in slow-moving traffic up to speeds of 40mph by assuming the tasks of braking and accelerating, while also temporarily taking charge of steering on better roads. The predictive efficiency assistant evaluates GPS information from the immediate surroundings and helps to save fuel by giving specific driving advice – a unique feature in this segment. Collision avoidance assist intervenes if the car needs to drive around an obstacle to avoid an accident. Based on data from the front camera, ACC and radar sensors, it computes a recommended driving line within a fraction of a second. Other assistance systems include turn assist, park assist, rear cross traffic assist, exit warning, camera-based recognition of traffic signs, Audi active lane assist and Audi side assist. The specification structure for UK A5 Cabriolet models will follow the same SE, Sport and S line pattern used by the Coupé, bringing alloy wheels in 17 or 18-inch diameters, xenon or LED headlamps, the Audi Smartphone Interface, leather upholstery, front seat heating, acoustic parking and three-zone climate control. Sport models and above add front sport seats with electric adjustment (Sport and S line) and sports suspension (S line only – optional for Sport), plus SD card-based MMI Navigation and all the features delivered by Audi Connect on an extendable three-month trial basis. The S5 Cabriolet takes on board its own exclusive specification including 19-inch alloy wheels, S specific styling, front Super Sports seats in Fine Nappa leather and chassis settings and hard disc-based MMI Navigation Plus including a three-year subscription to Audi Connect. 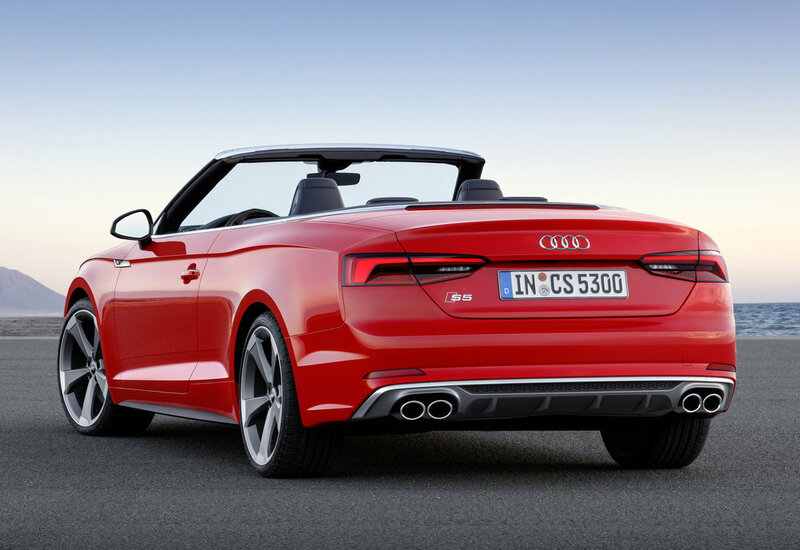 Prices for the new Audi A5 and S5 Cabriolet models have yet to be announced.